Many modern videogames are content-based. They can be “beaten” or “completed” and have, once started, a more or less strictly defined “expiration date”. Some tell a linear story, others provide a set number of pre-built levels. What they all have in common is that their lifecycle, the period of time during which they are able to provide “fun” or value to the player, is directly dependent on the amount of content included. Once the player literally “sees it all”, there’s no more enjoyment to be had and it’s time to buy the next title. But on the other end of the spectrum, there are systemically complex games of strategic decision-making, which are usually much more replayable and therefore tend to follow a match structure: You win or lose and then play again. But even these games are not infinitely interesting. It’s just that the player determines when they stop providing value and then decides to stop playing. The following article takes a closer look at this decision-making process and the involved factors, making a case for elegance, depth and efficiency in game design. At first, though, it makes sense to try and understand the market-dominating idea of content-based playing. In doing so, it’s worth taking a closer look at the observations of Richard Terrell, game designer (BaraBariBall) and author of the Critical-Gaming blog. He’s a proponent of the approach of analyzing games as systems, and developing a very specific and precise language to talk about game design issues in the process. One of his findings is that actual gameplay – by which he means “interacting (using mechanics) to influence an outcome of a game challenge” – is these days often overlooked by players, because it’s more difficult to perceive than other game elements, such as graphics, sound, story, collectibles or explicit achievements. The reason is that appreciating good gameplay is always based on a learning process. That’s a thesis we can actually find in many other places, including Raph Koster’s “A Theory of Fun for Game Design” or Daniel Cook’s representation of the basic game loop, that helps in showing how the process of gameplay is conceptually not too dissimilar from scientific theory construction (consisting of hypothesis, experiment, result, adjustment). Just passively consuming what’s presented is of course much easier than going through this learning experience. That’s why many game companies these days have specialized on requiring as little effort as possible from players, which is how they, according to Terrell, fit much better into a “movie-watching-music-listening culture”. In the end he came to the seemingly controversial but well-founded conclusion that “modern gamers do not like gameplay”, which he later refined again and called gameplay simply “invisible” to most players. Generally humans don’t appreciate, criticize or talk about the things that they can’t directly sense, experience or feel. The very immediate consumption of content on the other hand, as a form of numerically visible progress, is very obvious and easily perceivable: Level 5 is more advanced than level 4. Scene 27 is close to the game’s end than scene 13. An attack value of 283 is better than one of 240. When 82% of the world have been explored, the player has seen more than if it were only 65%. Whether gameplay challenges were actually mastered in the process is, for the moment, irrelevant. It’s not about intrinsically motivated playing for the sake of playing, and also not for the sake of learning. It’s playing for increasing numbers. The lifespan of such games corresponds directly to the amount of content they include. Players were accustomed to like this very explicit form of progress over decades, or at the very least to accept it as a given. The bulk of the industry has long since started to try and take advantage of the psychological phenomenon, that people like new things. That’s because we are naturally curious and sense the potential for value in something that we don’t know yet. That’s why always presenting the customers with new, shiny and relatively easily exhaustible products is, from a purely financial point of view, an extremely great and profitable idea. Whether the newly released games are actually “new” in the sense of being innovative, or whether they even are interesting at all, is secondary. Players are used to looking at the amount of content first. Games advertise with a huge number of items, levels or a game world that spans thousands of miles. Naturally, when confronted with a match-based game, most players quickly start to ask questions like this: “If there’s no story, what’s the point?” They are not used to assuming that there is value in learning to understand a deep gameplay system. The idea that the actual gameplay could make a game interesting and exciting is foreign to them. Sadly, this attitude is totally understandable, because regarding most modern videogames, there really isn’t much gameplay in games. However, there are counterexamples! Games that work as games. They are and were in the minority for a long time, but in recent years they started appearing on a regular basis. And indeed their underlying idea is one not to be forgotten, one that should maybe be a kind of paragon for large parts of the industry: a game’s value can lie at the heart of its uniqueness as a medium, in the ruleset itself. Games based on this assumption can be explored and deeply fathomed by the players themselves, independent from explicitly predefined, superimposed structures. Players progress autonomously by understanding the systems intricacies, without being whipped through a “campaign”. Of course, these games are also “exhausted” at some point, when they don’t deliver enough value in relation to the invested playing time anymore. But not just because the “tourist ride” has ended, and not because every bit of content has been presented. The lifespan of these games instead depends on the provided gameplay depth, and also on the efficiency of its delivery to the player. Many of those games not purely designed around content-consumption can be labeled “strategy games”. That’s true for games like Civilization or StarCraft that are commonly referred to as turn-based or real-time strategy games, but also for systemically complex action games like Counter-Strike or Spelunky. In all these games the players have to make complex decisions and, based on the feedback they in turn receive, learn to understand the system better over time. Tom Chick, independent games journalist and administrator of Quarter to Three, coined a corresponding term (and concept) years ago in an episode of the strategy game podcast Three Moves Ahead, which has since then been referred to as the “Chick Parabola”. It describes the course of the “fun value” while interacting with a new strategy game: at first there’s antipathy, because the player does not yet understand how the game works. Once he internalized the ruleset though, the rapid learning phase starts and the fun of playing increases. At its peak, the player can see through the game quite well, and that still feels good and satisfying, but subsequently problems start to arise. The player for example notices an exploitable weakness in the behavior of the enemy AI and the fun starts dropping dramatically. Even though Chick, in talking about his example game Empire: Total War, originally mostly referred to problems regarding the artificial intelligence, this graph can easily be generalized to encompass all complex games that require a learning process from the player: The more a system is mastered, the less potential value remains. Initiation Phase: The player learns and internalizes the ruleset. Fun, engagement and intellectual value are steadily, however rather slowly, increasing as more and more potential possibilities of interaction are discovered. Competence Phase: The players learns what “good” and “bad” actions mean in the context of the game’s goal, and how to identify them. He is constantly getting better at mastering challenges and reliably manipulating the system to his own advantage. Fun and intellectual value reach their maximum gradient. Conceptual Mastery: The player has essentially mastered the system. The ultimate “skill ceiling” (phase 5) is in sight and the necessary steps to get there (phase 4) are already quite clearly perceptible. Training Phase: The player is, through repeated exercise, approaching the limits of skill in the game. This can for example consist of memorizing optimal actions in specific, already completely solved situations, or perfecting the reliability of the performance in action games. The learning process is less rapid than in phase 2, getting better takes more effort and the potential value is dwindling. Dominance Phase: The player has reached the skill ceiling and thus fully exhausted the game’s depth. There’s nothing more to discover or to learn. The game is solved and has therefore lost its intellectual value, and with that the ability to provide fun. 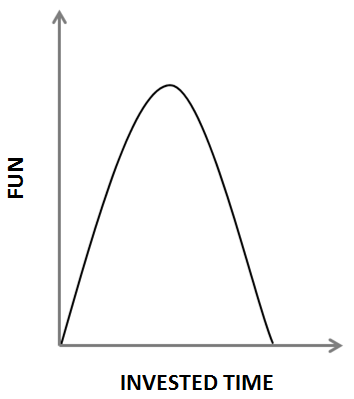 This graph is of course an abstraction and only meant to serve as a rough estimate of the actual process. 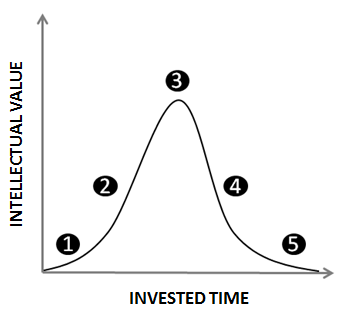 The “invested time” intervals on the x-axis are not necessarily evenly divided. In practice, given a specific game and player, the first phase could last much longer than the second one. For another situation there could be irregularities in the second phase due to the player “getting stuck” on so-called “skill plateaus”, or maybe there are positive “jumps” in terms of the learning speed. It doesn’t have to go upwards or downwards continuously. Of course, this can potentially lead to frustrations or even a premature resignation, and thus the abandonment of the entire process for some. Koster therefore defines a good game as “one that teaches everything it has to offer before the player stops playing”. Ideally, gameplay depth and lifecycle are in perfect harmony. In reality though, that’s rarely the case. Hence, to put the theory into practical perspective, the following sections will provide some examples and clarifications. League of Legends features an extremely complex ruleset. Therefore new players will have to spend a whole lot of time in the first phase. It takes at least multiple months of intensive playing to get accustomed to the general structure of a match, the distribution of character roles in a typical team composition, the myriad of items, the intricacies of the map and the neutral monsters, and of course also the countless characters and their respective skills. At least partially, the latter has to be deferred to the second phase, because new players don’t have access to all characters, but only those from the weekly changing “free rotation”. Furthermore, the focus of the second phase will be on evaluating strategic and tactical decisions: How offensive do I approach the “laning”? How early should team members leave the lane for a “gank”? When should a team battle be enforced? At this point, the true depth of a game, i.e. how much there really is to learn, shows. When the third step is reached and the system is conceptually mastered, the player enters the training phase. For example, coordinated patterns regarding the whole team’s behavior are practiced, and the so-called “mechanical gameplay”, the reliability of the physical execution, is improved. Interestingly, in the case of League of Legends the players will quite probably be required to return to phase 2 later, when a new balancing patch potentially renders the previously identified “good” strategies useless. The developer Riot Games regularly employs severe changes of the ruleset to almost create a new game. Thereby the game will be kept alive even for already very good players in the long-term. They constantly have learn new rules and their implications for the strategic possibility space. Collectible card games operate based on a similar principle. Without regular expansions, games such as Magic: The Gathering or Hearthstone would be competitively dead relatively soon. By taking a closer look at action-heavy games such as Counter-Strike or Spelunky, one can see the difference between phase 2 and 4 even clearer though. Once the rules are grasped, the second phase is primarily about concepts, asking the question of “What should I do in this specific situation?” Where should I stand? When and whom should I attack? Is it worth waiting for an even better opportunity? How big a risk should I take? Once the answers to these questions are largely found, phase 4 represents the training of the pure physical execution, the so-called “twitch skills”. In Counter-Strike that means particularly fast and precise aiming, ideally at the head of the opponent. In Spelunky on the other hand, it’s mainly about the battle against the controls and the physics of jumping. Of course these skills were necessarily already practiced a bit “on the side” in phase 2. but the learning focus was on the higher, strategic level. By the same token, pure reaction games like Guitar Hero cut out the second phase almost completely as all they require is mastering the individual tracks. When that is achieved, playing isn’t really worth one’s time anymore. Even in a game like StarCraft, accurate and fast clicking and button-pressing is almost as important as strategic finesse. Quite possibly the players will be jumping between phase 2 and 4 sometimes, when a temporary phase of (partial) conceptual mastery has been reached. However, the almost infinite utility of more “actions per minute” (APM) is the reason for players being able to spend years of perfecting their “micro” and “macro” game, and thus in phase 4. Appropriately Blizzard’s hit is therefore sometimes referred to as “chess on speed”. In the lifecycle of chess, there is also a fourth phase, but it obviously doesn’t include increasing accuracy or decreasing reaction times. It’s instead about memorizing specific sequences of moves, or respectively the proper answers, for early- and end-game situations. This process is distinct from the strategic learning and discovery in phase 2 (including board state evaluation and piece development). One of the most important principles of good game design is elegance. It allows for great accessibility, even in the face of huge gameplay depth, and is therefore necessary to efficiently deliver value to the player. In general, a game should be easy to learn, yet hard to master. The “easy to learn” thereby refers to the rules themselves and also an initial idea of what a “good action” means in the context of the system. The player should be able to acquire a good enough understanding of the game to then form and evaluate strategies autonomously as soon as possible. In regards to the lifecycle, this means that it should be possible to pass through the first phase relatively quickly. In transitioning to the second phase, the player has gathered enough information for his “mental model” of the game system to steadily gain competence by continuously playing the game. The second phase itself should then be as long as possible, since it represents the most potential value and at the same time a steady increase of fun and engagement. The idea might seem promising to design the first phase in such an intuitive way that the player can almost completely skip it. But these days, the term “intuitive” in most cases simply means that a similar or almost identical game design has already been there before in another title. This furthermore also leads to the second phase suffering severe losses because the players already know from another game how to play the “new” game well. Suiting examples can be found in modern single-player first-person shooters, third-person action adventures or puzzle platformers, which mechanically sometimes barely differ from many other representatives of their respective genre. By employing this “design tactic” they are even deprived of the last bit of systemic interestingness they could have had. But since they are often content-based anyway, that’s less important. All of this begs one question: Where does the fun stop? At which point on the lifecycle graph does the player quit? Well, that depends. The best games provide their players with a constantly efficient, yet long-lasting, learning experience in phase 2, while minimizing the necessary initial time investment of phase 1. They are easy to learn and a pleasure to master. If the primary motivation is really the improvement of the player’s capabilities, then playing beyond the point of conceptual mastery seems unreasonable in most cases. That is, if that point is even reached in the first place. After all, the final “ascent” usually already requires lots of effort due to the decreasing gradient. Passing phase 4 then primarily requires one thing: time. It would be much more efficient, at this point, to check off the game as “seen through”, put it aside and look for a new challenge. Especially highly competitive play does usually go way beyond that point though, and reaches deeply into the fourth phase. This is due to other motives besides intrinsic motivation kicking in, like fame and recognition when defeating the opponent. Even if the game is already mostly mastered and the intellectual value is rather low in relation to the time invested, the playing thus potentially continues. Professional players go even further than that though, due to the allure of prize money, trophies, wages and reputation. In many cases, they have already solved large portions of “their” game. Especially compared to normal players they can only advance extremely subtle nuances of their skill. Every tiny improvement requires an exorbitant amount of time, that’s not in any way justifiable if only just looked at in terms of mental gain. Yet they usually don’t change the game they play because they live on working their way close to or into the fifth phase of the lifecycle. In so far, here’s a comforting fact for all the “failed” StarCraft or League of Legends amateurs out there: Pro-gamers play suboptimally, in a sense.